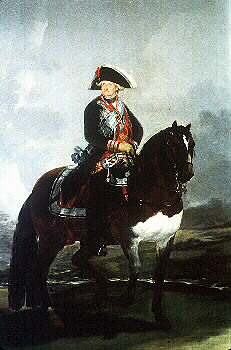 Carlos IV on horseback. Goya. Museo del Prado. Madrid. King of Spain, born in Portici (Italy) in 1748 and died in Rome on January 19, 1819. Son of Carlos III and María Amalia of Saxony, occupied the throne on the death of his father, from December 14, 1788. He spent his childhood and early youth in Italy, as he/she was born when his father was King of Naples. He/She was forty years old when he/she received the Crown, and his ascension to the throne was greeted with hope by the more conservative court sectors, since Carlos III had never enjoyed popularity among the upper echelons ecclesiastical and aristocratic. Despite a certain sense of Majesty inherited of the dynastic habit, the efforts of the count of Floridablanca, Minister of his father, interested in the tasks of Government were unsuccessful. Carlos IV seemed only interested in hunting, which occupied most of his time, and to keep away sin, since it was extremely blessed since his youth. Had tastes simple, such as carpentry and the array of watches, but I felt great love for music of Bocherinni and Francisco de Goyapainting. The French Desdevises du Dezert described it as follows: "was tall and athletic-looking; but his sunken face, his eyes off and his half-open mouth pointed to his appearance with an unforgettable stamp of goodness and weakness." He married his first cousin María Luisa de Parma, woman of intriguing mood and manifest lack of discretion. María Luisa dominated completely to her indolent husband, he/she managed to keep away from politics while he/she participated in all the courtly intrigues and assumed the Affairs of State. The ambition of the Queen was, however, greater than their capacity and soon delegated, disgusted, the tasks of Government. The Queen addressed the rise of your favorite and lover, Manuel Godoy, with whom he/she maintained a relationship since before the death of Carlos III. This had tried to avoid the scandals of her daughter-in-law, but once Queen, María Luisa used all his influence to make the most powerful man in the Court of Godoy. Already in his first office with the Secretary of war, Carlos IV promoted to Cadet garzon's bodyguards Godoy, appointment which began its meteoric promotion. Some biographers of Godoy have ruled out the sexual nature of their relationship with the Queen and attributed his surprising ascension loyalty which showed always to the Kings and the limited capacity of political action of these. However, it seems no doubt that some of the fourteen children that the Queen had also were Godoy. They only became six adults, including the Prince of Asturias, Fernandoand Carlos María Isidroinfante. 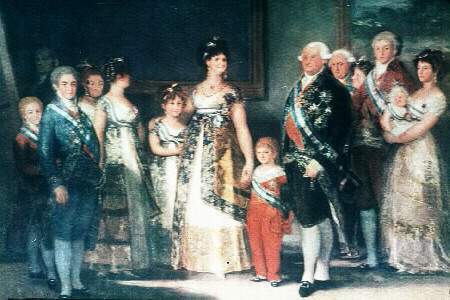 Goya: the family of Carlos IV. Museo del Prado. Before his death, Carlos III asked her son to keep to Floridablanca, Minister from 1777, at the head of the Secretariat of the Office. So the new King did during their first five years of Government. Queen María Luisa did know the old Minister who ruled he/she was and opposed with their intrigues continued obstacles to the normal development of the tasks of Government. Despite the expectations of the ecclesiastical and aristocratic sectors, Carlos IV preferred to leave the Affairs of State in the hands of Floridablanca, who strove to continue the policy of Carlos III. Populist measures put into force (lowered the price of bread destined for consumption of the poorest, forgiveness of arrears to the taxpayers...) and organized maritime expeditions of recognition of the Spanish discoveries in America, such as the Malaspina and Bustamante in 1794. The outbreak of the French revolution in 1789 provoked a violent reaction of Floridablanca, which tried to close Spain to any infiltration of revolutionary thinking. This period has been called the "panic of Floridablanca". The Minister imposed a severe intellectual censorship that commissioned directly from the Inquisition in September 1789. Meanwhile the count of Campomanes tried in the courts of 1789, gathered to recognize the succession of the Prince of Asturias, some progressive reforms, as it was the responsibility of the regime of entailed estates, and who were frustrated by the new political climate. The crackdown triggered by Floridablanca escalated when the 18 July 1790, a French dealt a stab wound that struck him of lightness. On the other hand, the domestic situation was compromised due to the severe frumentaria crisis that afflicted the country. This produced riots in Barcelona in 1789 and in Galicia and Asturias in the following year. The Government managed to suppress outbreaks of revolt, but this had the effect of increased fear of a revolutionary outbreak in Spain. Floridablanca again reinforced anti-French measures and in January 1791 he/she presented a report to Pope Pius VI, who was an ardent invitation to the counter-revolutionary crusade. According to Godoy wrote in his memoirs, Floridablanca was hated in court by his accumulation of functions. In February 1792 Carlos IV dismissed him suddenly, and appointed in his place to the count of Aranda, old man of seventy-three years whose mission would be, in fact, prepare a smooth transition to the Government of Manuel Godoy. Floridablanca was prosecuted and imprisoned, apparently at the instigation of Queen María Luisa, who threatened her husband to move to Parma. The Minister had tried to keep at Bay the Queen watching every movement and becoming aware of his amorous adventures. But in destitution likewise intervened the pressure exerted by the French ambassadors, so Carlos IV to officially recognize the new French constitutionalism. Aranda was an old Minister whose nomination was poorly greeted by all courtiers sectors. His domestic policy was reduced to serve the interests of Queen María Luisa, who was preparing the rise of Godoy. Indeed, in November 1792, Aranda was deposed and replaced by the young and handsome lover of the Queen, who own Carlos IV showed its support giving him the title of Duke of Alcudia and the order of the Golden Fleece. The promotion of Godoy had been surprising. maría Luisa de Parma entered in relation to the Godoy as Princess of Asturias, when the brother of Manuel, Luis, served as a bodyguard of Carlos IV. The Queen is seized of Luis without worrying about disguise their love affairs. Carlos III tried to avoid scandal by sending Luis Godoy out of court. During his absence, his brother Manuel made as a third party between the lovers, until he/she ended up occupying the place this in the bed of the Queen. While he/she lived Carlos III María Luisa sought not to raise the ire of his father-in-law, keeping some discretion in their adulterous relationship. But since the death of Carlos III the Idyll of the Queen was in the public domain. On the other hand, Godoy was a man without political experience, who soon showed its inability to effectively address the Affairs of State. However, their need for support and the hostility of the most reactionary sectors of the Court pushed him towards more progressive positions. His Government produced a true regrowth of the ideas illustrated in Spain, to relax censorship, and, given its alliance with France, by enabling new liberal air they circulate. The climate of persecution and intolerance became less oppressive and the powers of the Inquisition, were cut at the time that protected some notable, like Moratinor Pablo de Olavidemen. The reign of Carlos IV was marked decisively by the French Revolution of 1789. Floridablanca watched with horror the developments in the neighboring country. The Minister tried to maintain a policy of peace, escorada by his sympathy for England, so the European monarchies were prepared to fight in a common front against the revolutionary danger. However, Spain did not seem able to cope with a new war. On the other hand, Carlos IV was sincerely worried about the fate of his relative, Luis XVI and unwilling to compromise even more the fate of the French monarch. So the relations with the French National Assembly were extremely ambiguous. The Assembly proposed to Spain the fulfillment of the Covenants of family in the case, very likely, that a Franco-British war broke out. Floridablanca remained cerrilmente hostile relations with the new French regime and tried to avoid any sign of approaching revolutionary constitutionalism. On the other hand the count of Aranda was more tolerant and even allowed the entry of Frenchmen to Spain with the tricolor Cockade. He/She tried to strengthen the Alliance with France, but the progressive radicalisation of antiroyalist postures of the revolution led him to recommend awkwardly to Carlos IV Declaration of war. The French Convention threatened with formal rupture of diplomatic relations if Carlos IV did not officially recognize the revolutionary regime. Aranda was puzzled by these events. In the end he/she opted for a policy of armed neutrality, possibly following the opinion of the King not to commit further the already grave situation of Luis XVI. After Godoy in power, the new valid tried to stop the execution of the French King, without another strategy than spending money at close range in bribes. When finally the assassination occurred, Godoy declared war on France, in January 1793. This war had no reason other than the relationship between Carlos IV and Luis XVI and diffuse fear of the internationalization of the revolution. The Declaration of war against France in addition, supposed violation of Spanish traditional alliances and the collapse of the policy of neutrality established in times of Fernando VI. On the other hand, the Spanish army very disorganized, wasn't prepared for the ground war requiring the conflict. The contest, however, was received with enthusiasm in Madrid, because it was thought that it would deliver on French territory. As Supreme Head of the army, Godoy had three military bodies in the border Franco: one in Guipúzcoa and Navarre under the command of Ventura Caro, one in Aragon, whose head was the Prince of Castelfranco and another in Catalonia, under the command of general Ricardos. Only the latter got some victories in the Roussillon. Castelfranco and Ventura Caro suffered successive defeats in Figueras, Pajares, Hondarribia and Donostia. The military disaster forced the signing of a disadvantageous peace, agreed in Basel on July 22, 1795. The Basel accords restituían to Spain all French conquests in Spanish territory, in Exchange for the transfer to France of the Spanish part of the island of Santo Domingo. Paradoxically Godoy was acclaimed "Prince of peace" by Carlos IV. (See peace of Basel). The separate peace nature meant for Spain the war with England. The British Navy stopped all trade between Spain and America, while English agents favoured the independence of the Spanish colonies. The 19 August 1796 Godoy sealed the second Treaty of San Ildefonso with the French directory, which provided the military alliance Franco in case of declared war again. The conflagration was opened in October of that year. The Spanish Navy suffered a severe defeat at San Vicente Cape, the British conquered the island of Trinidad, Cadiz was subjected to a hard siege and in November 1798, the British troops conquered Menorca. The external situation produced a new Government crisis and Godoy was deposed in May of that year. Francisco Saavedrareplaced it. Saavedra Cabinet followed in a short space of time led by Mariano Luis de Urquijo (1799) and Pedro Ceballos (1800). Spanish policy was adrift, only being pushed by the current French intrigues and British pressures. In this context, Godoy retained a great political influence, an "unofficial" power that Carlos IV made him the true master of the situation while was officially supported the ultra-conservative Knight. The economic consequences of the war were disastrous for the Spanish Hacienda. The economic situation produced serious internal crises, such as the rebellion of Valencia of 1801, as the political opposition to Godoy began to forge a party around the Prince of Asturias and his Adviser, Escoiquiz, supported by the French. The situation forced Godoy to establish liberal reformist measures, such as confiscation policy, which had incalculable consequences on the change of social structures, both in Spain and in America. The sale, with Papal authorization, of the maestrazgo goods that would serve to pay debt, as well as the encomiendas of the military orders, of the memoirs, Waqf, brotherhoods and patronages lay, of the seventh part of the goods of the clergy, of the cathedrals and collegiate, measures which attracted the hatred of the privileged classes and the Church to Godoy was allowed. In October 1800, Napoleón Bonaparte as first consul, Carlos IV sealed with France the Treaty Alliance of San Ildefonso, and a few months later, the peace of Lunéville, which turned over Louisiana to France, which the Spanish Government displayed an unfortunate ignorance of American resources. In Exchange the Kingdom of Etruria was created for the Prince of Parma, son-in-law of the Spanish monarch. Napoleon thought to use the Spanish fleet to close the continental blockade against England, which included the cancellation of Portugal. The Treaty of San Ildefonso, Spain he/she was involved in the so-called war of the oranges in 1801. A Spanish cash, at the head of which was Godoy (pompously named "Generalissimo of weapons of land and sea") and French troops invaded Portugal, four months later requested the end of hostilities. The war of the oranges served to raise again Godoy to power, even though the relative failure that had led to the campaign, which had not achieved the conquest of the Portuguese Kingdom, deteriorated relations between the monarchy of Carlos IV and Bonaparte. In March 1802 the peace of Amiens signed between Spain, France, England and the Netherlands returned Minorca to Spanish sovereignty. Spain also acquired the plaza of Olivenza, on the border with Portugal, in Exchange for which Carlos IV recognized French dominion over Trinidad. Peace was not durable and in may 1803, France was again at war with England. The Spanish Treasury was exhausted. Had grown almost unbearable way fiscal pressure, the Royal House had to give up half of its budget for secret expenditures and was issued a loan whose interests exceeded the 87 million reais. Napoleon demanded the fulfillment of the Covenants in Spanish. Godoy tried to play the trump card of neutrality, which only Napoleon accepted in Exchange for a grant of six million pounds. England, however, did not recognize this agreement and continued to attack Spanish ships. The destruction of three Spanish frigates by the English forced Carlos IV to declare war on England in December 1804. The King entrusted the direction of military operations to the "Prince of peace", who launched a patriotic tirade aimed at the people. Godoy concluded a maritime Alliance with France, despite the fact that the Spanish Navy suffered losses of Finisterre and Trafalgar (October 1805). Godoy, but without daring to break their unequal alliance with France, was wary of Napoleon. Believing that it would be soon defeated and overthrown, in October 1806 and by surprise, Godoy released a proclamation addressed to the people that invited the rebellion against the tyrant of Europe. This proclamation, not Carlos IV, inked was incredibly inopportune to occur a few days later the French victory at the battle of Jena, which Napoleon beat Prussia. On November 1, 1806, Napoleon declared the continental block against England. The blockade had very serious consequences for Spain, because it involved their participation in a war which could not to confront. In the spring of 1807 Napoleon demanded Carlos IV the sending of an auxiliary army to his campaigns in the East of Germany. Shortly after, in July of that year, Napoleon signed the peace of Tilsit with Alejandro I of Russia, which recognized José Bonaparte as King of the two Sicilies. This was equivalent to violate with impunity the dynastic right of the Spanish Bourbons. Nevertheless, Godoy and Carlos IV not protested. Bonaparte was still thinking of the sea blockade of England through the cancellation of its main ally, Portugal. Blindly submissive to the designs of the French, Carlos IV and Godoy agreed, in October 1807 Fontainebleau Agreement, lend their support to the Napoleonic projects. This agreement included the division of the Kingdom of Portugal in three parts, one of which would be delivered to Godoy as the Algarbes Prince. Carlos IV would be recognized as Emperor of America. One of the clauses of the agreement determined that French troops would find franco to pass through Spanish territory on their way to Portugal.Al time, who signed the Treaty of Fontainebleau with Carlos IV and Godoy, Napoleon got in touch with the Court faction created around the infante don Fernando, heir to the throne. An anonymous letter discovered Carlos IV and his wife that his son conspired against them, when the French army is already in Spanish territory. Fernando came out unscathed this issue, apparently thanks to the mediation of their mother and the famous letter he/she wrote to his father and that begins with the words: "Lord: my Dad: I offence, I have missed to V.M. as King and as father..". Popular hatred of the Queen and Godoy and the low popularity of Carlos IV attracted the support of general to the Prince of Asturias, as he/she continued the advance of Napoleon's troops. The presence of a foreign army was growing popular unrest. Carlos IV wished ardently flee Spain, go to America as they had the Portuguese Braganza. However, the 16 March 1808 he/she issued a proclamation in which were understandably reassured his subjects about the intentions of Napoleon. The taking of Pamplona and Barcelona, and the rapid advance of the French troops towards Madrid, denied to the King. In Aranjuez, where he/she had been transferred to the Court, the apparent preparations for the flight of the Royal family and the popular hostility towards the Government of Godoy led the mutiny of the 17 and 18 March 1808. The crowd invaded the House of Godoy, who is saved by hiding inside a mat. Carlos IV, who believed him fled, dismissed him on day 18. When Godoy, fueled by hunger and thirst, each dared to leave his hiding place, there was a new algarada. The valid saved only thanks to the intervention of the Royal Guard and the Prince Fernando. The 19 March 1808 Carlos IV, overtaken by events, abdicated in his son. Upon hearing the news was a new riot in Aranjuez, which quickly spread to other parts of Spain as an explosion of popular joy at the fall of the monarchy of Carlos IV and Godoy. However, three days later, Carlos IV invalidated his resignation while he/she asked for support to Napoleon in these terms: "Lord my brother: V.M. will know, no doubt with a penalty, the events of Aranjuez and their result;" and you will not see with indifference to a King who, forced to give up the Crown, goes to a large Allied monarch his arms, subordinating is completely at the disposal of the only one who can give her happiness, his family and his faithful vassals. I have not waived in favor of my son, but by the force of circumstances, when the din of weapons and the cries of a sublevada guard made me quite know the need to choose life or death, as the latter had followed after the Queen. I was forced to resign; but now secured with full confidence in the magnanimity and the genius of the big man who has always proved to be friend of mine, I have taken the resolution satisfied me with everything this very large man wants to have us and my luck, the Queen and the Prince of peace." Napoleon repudiated the luck of the King and his son Fernando. To deliver the final blow to the Bourbon monarchy, the Emperor played again with the clumsiness of the Spanish Royal family, offering to arbitrate in the conflict. He/She organized a personal interview with Fernando in Bayonne, April 20, 1808. A few days later arrived separately, Carlos IV, María Luisa and Godoy, released this by express order of Napoleon. The rest of the Royal family should arrive in May. But the people of Madrid, fearing the final March of the Kings and the return to power of Godoy in the hands of the French, began an insurrectional movement which the war of independence launched the May 2, 1808. The outbreak of the rebellion movement prompted Napoleon to demand the resignation to the Crown of Spain, both from Prince Fernando and as to Carlos IV. Both made gala of pettiness and servility in those days of Bayonne. Napoleon got easily the resignation to the Crown with two conditions: that respected the territorial integrity of Spain and the Empire of Catholicism. Napoleon José I gave the Spanish throne to his brother, José Bonaparte, now. Meanwhile the insurrection against the French occupation stretched to all Spain with unusual force and effective Government remained in the hands of a Central Board. Carlos IV would no longer return to Spain. While his son was recognized again by Napoleon as King of Spain in 1813, and hailed by the Spanish people shouting "Long live chains! ", the old King repudiated the events, as he/she had for the rest of his life. He/She settled permanently in exile and resided in Compiègne, Marseille, Verona, Valençay and Rome, where he/she died in 1819. ARTOLA GALLEGO, Miguel. The origins of contemporary Spain. Madrid, 1959. FERNÁNDEZ DE PINEDO, e., GIL NOVALES, a. and DEROZIER, A. centralism, illustration and agony of the ancien régime, in "History of Spain" directed by Lara M.tunon. Barcelona, 1980. Martinez RUIZ, e., GIMENEZ, e., ARMILLAS, J.A. and MAQUEDA, C. The modern Spain. Madrid, 1992.